Following a mild start to winter for not just the United Kingdom but also large parts of North America, thoughts are focused on the chances of something more wintry for the final half of winter. There’s still 6-7 weeks left of meteorological winter left and 9 weeks or so of astronomical winter – so plenty of time to pick up some snow and cold weather. The stratospheric profile continues to put pressure on the current mild set up which although shows no sign of being completely reversed, is being put under considerable pressure which results in the chances of cold in the final half of winter being somewhat increased. Not all sudden stratospheric warmings are created equal though – some fail to propogate their easterly winds down to the surface. Events of winter 2016/17 remind us of that – a healthy SSW following by a failed propogation. More often that not, if the surface environments are not supportive of cold and easterly flows to begin with, then the affects of the SSW will be “fought with friction”. This is why, I, am not forecasting severe winter weather into the rest of January and into February – although it could happen. Instead I am more confident of “ups and downs” for the remainder of winter. The final half of winter is likely to produe a collective Central England Temperature below the first half, however probably as cold as the first half was mild, so this winter I’d say is likely to come out with a temperature anomaly above average – although I could be wrong. As per the recent model output, there is now increasing likelihood of a colder incursion next Thursday & Friday. Whether this will be an extended incursion is uncertain, however computer models are quite keen on building a weak area of high pressure to the north west of the UK later next week into the weekend of the 19th / 20th of January. This could develop more of an easterly flow across the British Isles during this time frame. In the British Isles anything more than about 5 days ahead as a forecast is uncertain, so although the risk is there the uncertainty is also there. This is well established in today’s model output with the GFS making slightly less of the northerly incursion next Thursday / Friday. 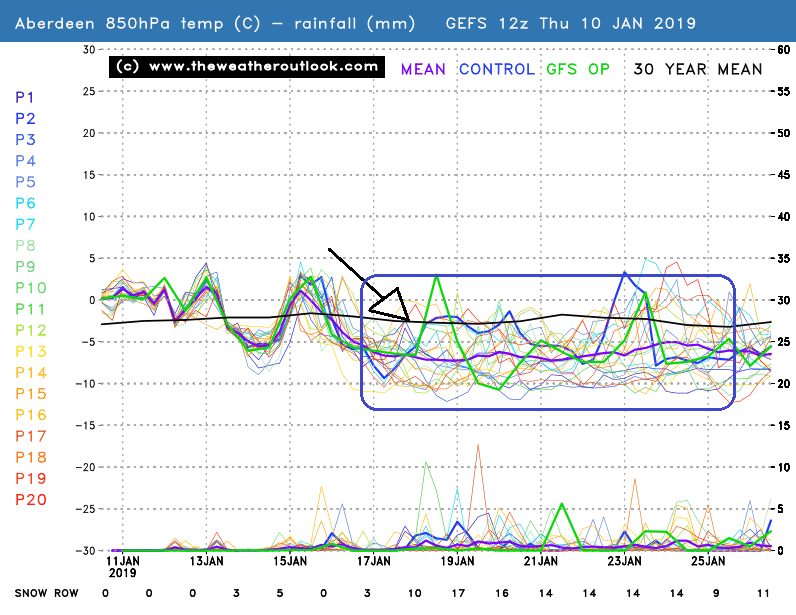 This ensemble forecast from TheWeatherOutlook.com shows temperatures dropping off late next week and we actually set up quite a prolonged cold signal from the various members. Although the GFS 12z is somewhat of an outlier in the way that it handes the northwesterly / northerly wind next week, the general concensus from the ensemble group is quite a chilly one with an increased chance of snow towards the final third of January. Of course, usual uncertainties apply. Snow is tricky to forecast and details with regards to a snow forecast can not be produced until say 48 hours prior. Having said that though, if the current model output is correct then snow fans have a reason to be interested in the outlook. The idea of a southerly tracking jet stream combined with “weak” blocking to the north west, which is not the classic very strong northern blocking that occured during the best ever spells in the UK, like last February’s beast from the east, is not neccesarrily a bad one. It can produce some decent snow events and some level of cold weather. December 2017 had a similar set up and large parts of the country had some healthy snow events. Next week’s initial northerly has the potential to bring snow – exactly where and how much is uncertain. Wintry showers on Thursday & Friday are possible for northern areas and some places, especially on high ground run the risk of some snow cover. This entry was posted in Uncategorized and tagged Snow update on January 10, 2019 by admin8.